Over $15,300 raised in 2018! Planning for 2019 starts soon. We raised $12,500 in 2018! Our 2018 crew raised $8,000+! Props to our West Coast Crew! for Child's Play in 2018! 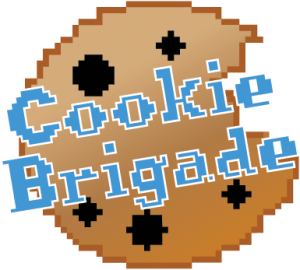 What is the Cookie Brigade? What started in 2007 as two people randomly handing out cookies to people waiting in lines at the Penny Arcade Expo has become a unstoppable force for good! Brigadiers bake cookies and other tasty treats and give them out for free, while handing out tasty treats the Brigadiers accept donations to Child’s Play. Since 2007 we’ve raised more than $500,486 for Child’s Play. Our South crew smashed last year’s total by raising $12,000 for Child’s Play this year. Nipping on the heels of South, PAX East is almost here. Can we beat last year’s great showing? Traversing several of Seattle’s city blocks, our tireless brigadiers go the distance to make sure attendees get their sugar fix. With a small crew but some powerhouse distributors, we raised $17,575 for Child’s Play in 2016. Bringing a new twist on the formula, Philly will pull the cord for the first PAX centered on tabletop games. "I love being a distributor for #cookiebrigade. It makes me believe that people are good." "Help me, Cookie Brigade, you're my only hope. (Bring gluten free)"
"Guy who gave me $50 in Arachnid: Did that bill have onion on it b/c my eyes just started leaking."